Thomas Brookes Minshall was born in Northwich, Cheshire, on 18 August 1888. He was the son of William and Mary Jane (née Brookes) Minshall. William and Mary already had three daughters, Ellen Beatrice, Lilian Mary and Marion, at the time of Thomas’s birth. In 1890 their fifth child, Jane, was born. William, a timber merchant, died in 1894 at the age of 38. Mary Jane lived to the age of 78, and passed away in 1937. 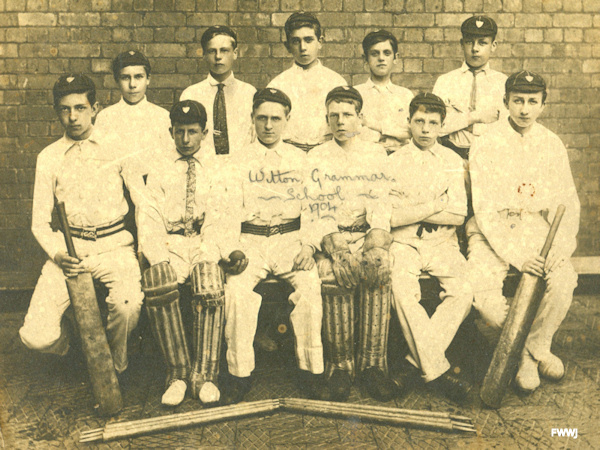 Thomas was educated at Witton Grammar School, in Northwich, and is pictured right and below in the school cricket team in 1904. 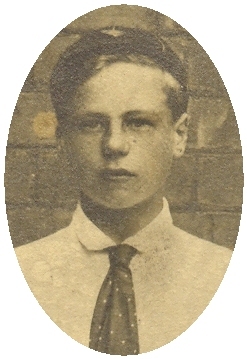 That year, aged 16, he joined Brunner Mond & Co. and started work in the Goods Received Section. Can anyone identfy members of the cricket team?